Independent financial consultant Jim Hansen runs every investment through the “peak oil test”. 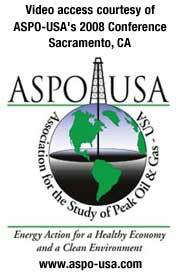 In this presentation from the ASPO-USA 2008 conference, he explores traditional energy investments; opportunities in renewables, rail, and electrifying the transportation system; areas to avoid like airlines and trucking; and what to watch, like electric cars and the unwinding of globalization. In this interview, ecologist and professor Charlie Hall looks at energy return on energy invested. Whether it’s a cheetah chasing antelope, or humans making ethanol — the energy we get back has to exceed the energy we put in, or the story is over. He compares oil’s energy return in the 1930’s (1 calorie invested returned 100 calories of energy) with the current situation (1:12) and still declining. Presenters respond to the final question in the Q&A session at the close of ASPO-USA’s 2008 conference: how do we better harness the intellect, energy and commitment at this conference, and what one thing would you have people ask an elected official to do about peak oil? Episode 136.